© 2009 Bernd Biege licensed to About.com, Inc.
Saint Valentine, patron saint of lovers and celebrated on February 14th, is a Dub (as Dubliners are commonly called). 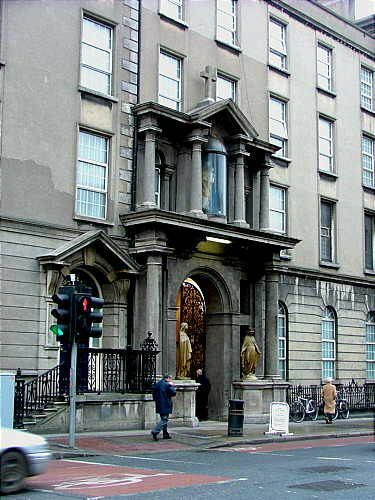 His remains are to be found in Dublin, in the Whitefriar Street Carmelite Church. Enjoy some images of this outwardly strange, yet internally beautiful place. The exterior of the Whitefriar Street Carmelite Church is unimposing - in fact it almost looks like an apartment dwelling. Unless you count the massive portal (which sits uneasily on the utilitarian façade), and the life-size statues of saints flanking it. Of course, locals know where to go, and for the casual visitor there are signs. But still ... low key seem to be the word. Which does not change immediately inside, as you are faced with a long(ish) corridor until you at last enter the church. Saint Valentine's Shrine is certainly colourful ... the remains in the casket below the altar are paraded during a special ceremony on February 14th. Which is, oft course, Saint Valentine's Day, when the Carmelites also lay on a special service for all those in love. Not a big shmooze-fest (though in front of the relics of the Patron Saint of Lovers is certainly one of the best places to steal a kiss in Dublin). More imposing than the exterior and with a middle-eastern feel - the altar of the Carmelite Church. I certainly am under the impression that the Carmelites have a thing for very colourful, life-size representations of saints. The Church of Saint Joseph opposite Dublin's Mater Hospital also displays a wonderful array of such religious artwork (admittedly, it may not be to everyone's taste). Saint Valentine's statue - Dublin's Carmelite churches seem to have a penchant for life-ize and colourful saints. By the way: Saint Valentine, patron saint of lovers, is an Irish saint by adoption only. And certainly not as important as Saint Patrick, definitely not as Irish as Saint Brigid. In 1836 bones exhumed from the catacombs of Saint Hippolytus on the Via Tiburtina were identified as being the earthly remains of Saint Valentine. This positive identification must rank alongside the more improbable feats of Dr Temperance Brennan and the whole Jeffersonian Institute as being ... yeah, let's just say "next to miraculous". But the now identifies saint was swiftly placed in a casket, and then whisked off to Dublin. As an official donation by Pope Gregory XVI, to provide a focus of veneration for the re-emerging Catholic faith in Ireland. At this time Roman Catholics were finally allowed out of the closet, but most ancient relics were missing, and old churches often taken over by the Church of Ireland. By providing a bona fide 3rd century saint for Dublin, Gregory managed to bestow some instant antiquity on the Carmelite church. The dispenser for Holy Water in the Carmelite Church has a very utilitarian design. To say the least ... we have several of these water butts in our garden, for harvesting rainwater ... all we'd need is a priest to bless them, I guess. Though this is not the strangest dispenser of Holy Water I have seen in Ireland. At Cobh there is a tap outside the church, and the long line of Holy Water dispensers (complete with biblical, artistic design) that line the main car park at the Marian Shrine of Knock has to be seen to believe. Having said that, I suppose if you believe in the Holy Water itself, it does not make a difference how it is dispensed. Though I sometimes wonder why many of the dispensers are clearly marked with a health warning, noting that the water is not for internal consumption. Meet the Most Important Female Saint of Ireland - Brigid of Kildare. Hang On ... There May Have Been Two Saint Patricks in Ireland?